Europe has a well-earned reputation of being one of the most fascinating continents to explore – particularly in terms of monuments. And whether we’re talking beer, traditions or history, it would take a lifetime to truly enjoy the beauty of Scotland. Surprisingly enough, though, one of the most fascinating landmarks isn’t on land – but by the sea. Looking from afar of the village of Biel in Dunbar, Scotland, one can notice a rather small-sized bridge right in the middle of the water. So what is the story of this seemingly pointless bridge that creates such a lonely, mysterious view? The Biel Water is a stream that could be seen as the landmark of the Biel village. Starting at the Luggate Burn, the river runs for 4,5 kilometres (almost 3 miles) right through the village and finally meets the Belhaven Bay in Southern Scotland. 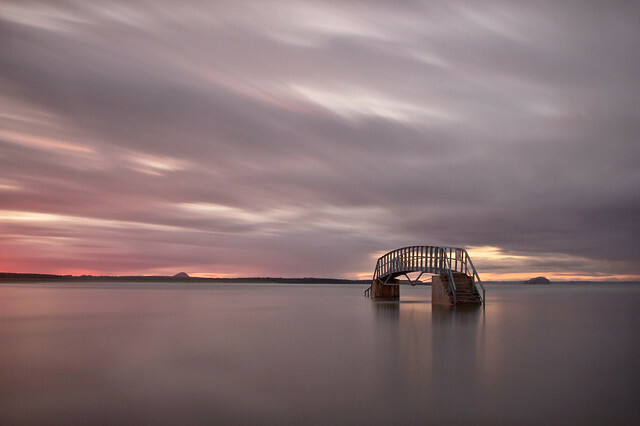 During low tide, locals and tourists can use the bridge to walk over the Biel Water and get to the Belhaven Bay beach. The scenery of this beach combines sand dunes with salt marsh and grasslands that provide a splash of color. that this is one of the sunniest areas of Scotland. The view is spectacular, particularly during sunsets, thus creating an ideal scenery for photography. However, high tide creates an equally spectacular atmosphere and offers the shore a new perspective. At this point, most of the bridge is covered in water and it’s nearly impossible to cross over it. Even so, those who want a quiet, romantic spot or tourists who want to capture a memorable moment are looking forward for a high tide. During the cold season, the Belhaven Bay is covered by fog, thus emphasizing the mystery surrounding the bridge. Meanwhile, spring and summer fill the views with bright colors which turn the village of Biel into an unforgettable Scottish destination. However, passionate photographers are meeting here regardless of season to find new ways of capturing the unique beauty of the location. The Belhaven Bay beach is part of the John Muir Country Park, a 7.73 square kilometres park founded in 1976. The area shelters more than 400 unique species of plants and multiple types of butterflies and birds that turn a trip to the Biel village into a complete experience designed by nature itself.